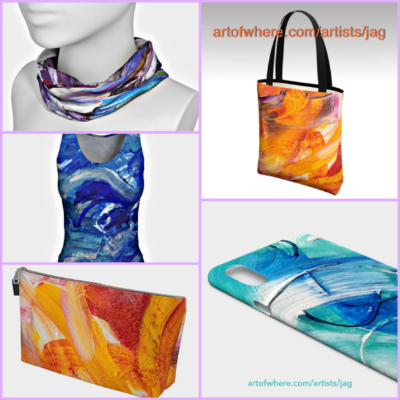 I’m excited to share with you that I have a new Art Boutique Shop that has a selection of my abstract paintings printed on merchandise like tops, scarves, tote bags and even iPhone covers! These are some great and unique gift items for others or yourself. For instance see this tote bag with my Energy Shift painting on it that I’m modeling. The tote bag has options for getting it with a lining or unlined, this version is lined with some zipper pockets and holds a lot of my stuff. It’s also available in an orange toned painting. Make sure to browse and let me know if you have any questions about it. Prints are available too on a variety of interesting surfaces like metal and acrylic, canvas and more in different sizes. This is a completely online shop – all you do is click the link below and start shopping!